13 is certainly not an unlucky number for Chatham’s David Huff (UCLA), who has been named the Coca Cola Pitcher of the Week. Huff blew away 13 Brewster hitters on August 6 and in the process recorded the win and kept the A’s within one point of front-runners Orleans. Huff finished the game with eight innings pitched, no walks, no earned runs and scattered only four hits. Huff is the seventh Chatham player this season to be honored with either a Pitcher or Player of the Week selection. After hammering four homeruns and knocking in nine RBI in fives games this past week, Falmouth’s Shelby Ford (Texas Christian) rightfully deserves being named the Coca Cola Player of the Week. Ford, a native of Fort Worth, Texas, collected 10 total hits in 19 at-bats with an unbelievable .526 batting average. However, his slugging percentage (1.263) and on base percentage (.609) are an indication of the headaches he gave to opposing pitchers throughout the week. Ford now sits in third place in the overall RBI category with 31. As the regular season winds down, the Chatham A’s find themselves battling with the Orleans Cardinals for first place in the East Division. For the first time since 2001, Chatham has gained a postseason berth, having clinched with a win August 3 against Cotuit. Considering the outstanding individual seasons so many of the A’s players have enjoyed, their success as a team is not surprising. For the second time, Chatham players captured both the pitcher and player of the week during the course of seven days. Jared Hughes (Long Beach State) and Evan Longoria (Long Beach State) accomplished the feat during the second week of play, and Derrick Lutz (George Washington) and Todd Frazier (Rutgers) followed suit in week seven. Lutz joined many of his A’s teammates at the annual All-Star game last Saturday in Hyannis. In fact, as the visiting Eastern Division all-stars took their hacks in the first inning, the lineup very closely resembled the one that takes the field regularly at Veterans Field. Three of the first four batters for the East were A’s, including Alex Presley (Mississippi), Baron Frost (USC) and Longoria. Lutz joins Longoria as the only player to receive the Coca-Cola player of the week award twice this summer. Although Sports Ticker chooses the player of the week, no one can argue with its decisions. These A’s have been more than deserving of the honor. Lutz, the league’s leading closer with 12 saves, has pitched 25 innings this summer. During those 25 innings, he has faced 75 batters; zero of them have crossed home plate. He allowed no hits, runs or walks during his inning pitched at the all-star game, striking out one and retiring all three batters he faced. Every championship team needs a reliable closer to nail down wins at the end of the game; not surprisingly, Lutz and his Orleans counterpart, Steven Wright, are the top closers for two of the best teams on the Cape. Frazier has put up equally impressive numbers in the middle of a powerful Chatham lineup. The Toms River, N.J., native had a monster seventh week of the season, hitting two home runs and driving in seven runs in just 15 at bats. Frazier, who has two brothers in major league baseball organizations, continued to tear it up after the all-star break. He is in the top five in the league in triples, RBIs, slugging percentage and extra base hits. 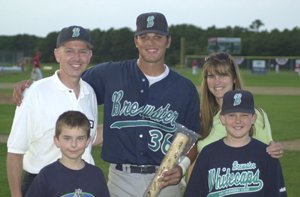 Brewster Whitecaps’ slugger Aaron Bates (NC State) enjoyed a tremendous season on the Cape. An all-star for the East Division, Bates was crowned 2005 CCBL home run hitting champion last week. On top of his 5-5 performance against Y-D earlier this week,the first baseman was named as the team's Most Valuable Player by Brewster officials. The Whitecaps handed out numerous other awards to deserving players before Saturday's last home game of the 2005 season. P.J. Walters (South Alabama) earnedMost Valuable Pitcher award after posting a 5-1 record with a 1.90 ERA and posting 56 strikeouts in 52 innings. Whitecaps' reliever Jonathan Hovis received the Fireman Award for his team-leading eight saves and 1.52 ERA. Winthrop teammates Tommy Lentz and Heath Rollins were recognized for their many contributions to the Whitecaps. Lentz was awarded the Gordon Hatfield Memorial Award for leading Brewster with nine stolen bases. Rollins earned the Ty Brown Award for his outstanding leadership, versatility and sportsmanship. North Florida's Matt Oxendine played a solid shortstop since his arrival on the Cape and was awarded the Janice Edwards Memorial Award for his defensive efforts. Oxendine batted .229 and committed only three errors this season. Brewster's Rob Horneman, a native of Glendora, Ca., was awarded the 2005 Sportsmanship Award. The final week of action for the Whitecaps (18-25) was full of defensive highlights. Brewster rode a three-game winning streak into Saturday's match-up with Chatham, thanks to strong pitching outings by Walters, Rollins, and Oklahoma's Will Savage. It has been an up-and-down season for the 2005 Harwich Mariners, who find themselves in fourth place entering the final weekend of the regular season. Despite falling upon tough times earlier in the season, the team showed resilience bouncing back from an extended losing streak and putting together a nice string of wins. Coach Steve Englert believes the performance of right-hander Tim Lincecum (Washington) was a big reason the team was able to right the ship. Lincecum, owner of the league’s best earned run average among pitchers who have thrown at least 32 innings, has been a steadying presence in the Mariners’ bullpen. Along with his miniscule 0.72 ERA, the sophomore has a 2-2 record with 64 strikeouts, 11 walks and six saves. He did not exclusively pitch out of the bullpen, as he started three games, even notching one complete game. Last Saturday, Lincecum was one of three Mariners representing their team at the All-Star game in Hyannis. He was joined by infielder Scott Sizemore (Virginia Commonwealth) and Chris Emanuele (Northeastern) at McKeon Field. Lincecum was the second pitcher to enter the game for the East, following Chatham’s Jared Hughes to the mound with a perfect third inning. Things continue go well for the first-place Orleans Cardinals in this Cape League season, especially with East All-Star MVP Colin Curtis (Arizona State). The Cardinals are still in first place in the East Division and fighting hard to keep that spot against arch-rival Chatham. The Cardinals have capitalized on opportunities all season, and it has helped them to win games. And while no one wants to upset the “Baseball Gods,” with only a few days left to play, it would be no surprise if the Cards continued to fight off the Chatham A’s, who have been threatening to take over the coveted number one spot all season long. During last week’s All-Star Game, Curtis went 3-for-4 with one run scored, and that run turned out to be the only run on the game. Along with Curtis, the Cards boasted four players in the mid-summer classic at McKeon Field in Hyannis. Curtis was one of two starters for the East team as well as teammate Emmanuel Burris. Burris continues to lead the league in stolen bases with a team-record 35 on the season. Burris’ teammate Curtis has also been a big contributor for the Cards this season, batting .333 with a .406 slugging percentage. Joining the starters from Orleans were reserve pitchers Steven Wright (Hawaii) and Brad Meyers (Loyola Marymount). Unfortunately, the Y-D Red Sox will not be able to defend their 2004 Cape League title, but they have had a great season and in the process managed to place six players on the All-Star team roster. The starters for the East Division from Y-D were catcher Danny Lehmann (Rice) and designated hitter Jeff Kindel (Georgia Tech). Kindel went 1-for-4 in the All-Star game and is currently batting sixth in the Cape League with a .309 average. Kindel, has steadily improved all season with the Red Sox and has now emerged as one of the top prospects in the Cape League. Lehmann has also contributed to the success of the Red Sox so far this season. The star out of Rice University is currently batting .253 with a .356 slugging percentage. Joining Lehmann and Kindel as reserves for the East team were catcher Jordan Abruzzo (San Diego), infielder Chris Errecart (U Cal Berkeley), pitcher Tim Gustafson (Georgia Tech), and pitcher Brandon Morrow (U Cal Berkeley). Also, joining the six Y-D Red Sox that made the All-Star team was Y-D Field Manager Scott Pickler. Pickler has been head coach of the Y-D Red Sox for seven seasons. In his sixth season with the Sox, Pickler helped to lead them to a Cape League Championship in 2004. Pickler has also been named “National Coach of the Year” three times! The Bourne Braves have one game left this season and its pretty much a guarantee that by the time Monday rolls around, they will have captured their first Western Division title since 2003. In that year, the Braves lost the championship series in two one-run games to the Orleans Cardinals. Boston Red Sox bench coach Brad Mills feels beating the Braves this season will take a considerable effort from any opponent as they head down the stretch and into the playoffs. “It’s a balanced club with pitching and guys up and down their lineup who make contact,” said Mills Tuesday at Fenway Park. “Nobody is an easy out and with all the left-handed hitters they got, they put the ball in play. So it’s going to be a tough ball club to beat because of that – there’s not a lot of swings and misses in that lineup,” said Mills, who was also in attendance at last Monday’s Braves’ home game. The Braves presently sit in first place with 49 points and are 5-5 over their last 10 games. In last week’s All-Star Game, the Braves sent three representatives to take part in the 43rd annual Cape League summer classic. Brad Lincoln (Houston) went one-for-two with a walk and batted behind Falmouth’s Mark Hamilton. Forrest Cory III (William & Mary) came on in the fifth inning and faced three hitters, only giving up one walk. North Carolina State’s Gib Hobson, who has impressed many this summer and sits only behind Chatham’s Jared Hughes in wins with six, did not get into the game, but certainly appreciated being selected to the All-Star team. “It was a great honor being selected to play in this game. I enjoyed being here and had a lot of fun,” said Hobson. As Bourne gets ready for its first post-season run since 2003, many continue to wonder how this team, which has only hit a team .221 batting average, continues to be at the top of the Western Division. The answer is clear: pitching, great defense and team chemistry. The Braves are second overall in team ERA (2.28) and have given up the second fewest hits in the league with 291 – only behind Orleans (293). However, Mike Hernandez (Oklahoma St.) – a name we haven’t heard much from this season – has had two triples and sits in third place in overall extra base hits with 14. Lincoln continues to hammer the ball and presently sits in third place in league slugging percentage (.459). Both are big reasons why the Bourne Braves have sat at the top of the Western Division all season long. With two important games remaining against West Division foes, Cotuit hopes to continue its late season streak and claw into the playoffs. The Kettleers have battled Wareham for second place in the West for the majority of the season and with a few key wins this week, the Kettleers have taken control of second place. Cotuit has to get past rival Wareham to solidify the second seed and guarantee themselves a trip to Bourne Tuesday at 3 p.m. for the West Divisional Playoffs. Cotuit’s been winning games with its aggressive style, timely hitting and an unheralded pitching staff led by Caledonia, Mississippi product Josh Johnson (Miss. State). Johnson is 4-0 with a 1.58 ERA and 27 strikeouts. Johnson who just completed his sophomore year at Mississippi State, went 5-0 for the Bulldogs in the spring and has continued to pitch well in the Cape. With a flawless record and a low ERA , these facts seem to warrant an all-star game appearance, but Josh was left off the West’s squad. The lone pitcher to represent the West was Boilermaker flame-thrower Chris Toneguzzi (Purdue), who pitched a scoreless eighth inning in last Saturday’s All-Star game. In the last week of play, Cotuit has faced some of the league’s best teams and has had great success. Johnson pitched six strong innings against a talented Chatham team, which sent eight players to the all-star game, in a game that ended in a 2-2 tie. The Kettleers came up with a big win in Friday night’s game, which was called due to the severe weather. In six innings, Clay Dirks (LSU) allowed one run and Clemson product Daniel Moskos earned his first save. Because Cape League teams consist of the premier college players in the country, roster turnover and shuffling is common. Players miss games due to a variety of other commitments, including the College World Series, Team USA and the MLB draft. When general managers draft their teams, they know there is a good probability that many of these players could be gone come summer. Amidst all the change, there has been one constant at third base for the Falmouth Commodores the past two summers. Matt Antonelli (Wake Forest) has been a steady presence both at the plate and in the field. He played in 41 games for the 2004 Commodores squad that lost to the Y-D Red Sox in the championship game. As the last week of the regular season winds down, Antonelli has appeared in 36 games for this year’s team. Antonelli is definitely a fan favorite, which is partly due the fact that he is a native of Peabody, Mass. Homegrown talent is definitely appreciated in Cape play, but fans also respect the way Antonelli plays the game. Antonelli was chosen as an all-star during both of his summers playing the hot corner in Falmouth. Last Saturday at McKeon Park, Antonelli went hitless in his two at-bats. However, his teammates fared no better, as the Western all-stars were able to muster only two hits against the East’s pitching staff. In 2005, the Demon Deacon is hitting .256 with one home run and 12 RBI. He is second in the league with 29 runs scored, trailing only teammate Chad Huffman in that department. Similarly to Johnny Damon of the Boston Red Sox, Antonelli has an excellent chance of crossing the plate if he gets on base, as he bats at the top of a very powerful Commodore lineup that includes Mark Hamilton (Tulane), Shelby Ford (Texas Christian)and Jon Still (Stetson). While it has been a truly forgettable year on the field, the last-place Hyannis Mets continue to do themselves proud off the field following their hosting of the highly-successful 2005 Cape League All-Star Game. This past Wednesday, the Mets hosted The Pavilion (skilled nursing and rehabilitation center) Night at McKeon Park, where 15 wheelchair-bound residents and six volunteers arrived in two vans to watch the Mets-Bourne Braves game. “The residents were so excited about this...it has been the topic all July,” said CCBL President Judy Walden Scarafile, whose 91-year-old mother and resident Barbara Walden enjoyed a front row seat behind home plate. “For people who don’t have much excitement in their lives, this is a real neat thing. The Pavilion donated two gift baskets to the 50/50 raffle, with each basket including a Mets t-shirt and other items. Each resident received a t-shirt and one of the staff members threw out the first pitch. With their loss to visiting Falmouth in their home finale Friday, the Mets (7-35-1) set a league record for most losses (34) in a season. Third baseman Kyle Norrid (Memphis) leads Hyannis in hitting (.260, 1, 13), while All-Star first baseman Andy D’Alessio (Clemson) is close behind (.252, 1, 16). The Mets have received power from their catching corps of Justin Tellam (UNLV) and Teddy Dzuiba (Babson), who’ve combined for seven of the team’s 10 homers this season with four and three respectively. With Wareham experiencing its worst losing streak of the season, the struggles couldn’t have come at a more inopportune time. The Gatemen lost four straight games coming down the home stretch of the season. With a huge game against Cotuit Saturday to keep their playoff hopes alive, there has never been a better time to snap out of a slump. As it has been the case all season, the Gatemen look to their pitching staff to keep them in the playoff race. When asked about his last couple days Bard felt like things really couldn’t get much better. His fellow Gatemen who represented the West All-Stars agree, it really has been a great week. The players were awarded for their excellence with a trip to Fenway in what was a thrill for all involved. The players have been having a great summer full of new experiences for all those involved. The Gatemen now need to focus, since their second place position in the West has slipped away. They rely on Bard to pitch their final game at home. As for now all they want is a chance to make the playoffs coming into Sunday and they feel pretty confident that Bard will give them a great outing. Last Pitch at Cape Tech: Long-time board of director and high school AD Barry Souder threw out the ceremonial “last pitch” in the Brewster Whitecaps’ home finale at Cape Tech Field Saturday. They move to their new field in Brewster next season…Burriss On The Air - Jeb Fisher of CN8’s Sports Plus (Channel 3) was in Orleans to film a segment on the Cardinals’ Emmanuel Burriss for Sports Pulse. The feature aired on the Aug. 4 show at 10:00 p.m. It will be rebroadcast by using the On Demand feature and selecting Get Local. Manny (Kent State) is currently leading the CCBL in stolen bases (35, a Cardinals record) and hits (48) …Roy Bruninghaus Memorial Donations - The Cardinals’ organization wishes to express its thanks and appreciation to the family of the late Roy W. Bruninghaus, former Cardinal pitcher and CCBL Hall of Fame member, as several memorial contributions in Roy's name have been received…Red-Hot July - The Cardinals set a CCBL record for most wins in July with a record of 19-6 for the month…Hunter Jones signs with BoSox: Cardinals ace Hunter Jones (Florida State) signed a professional contract with the Boston Red Sox in late July and is a member of the Lowell Spinners (New York-Penn League)…Alumni Updates and Current Statistics: Through the joint efforts of the CCBL and Sportsticker, current stats for CCBL alumni active at all levels of professional baseball are being compiled and are available on the CCBL website, www.capecodbaseball.org under Alumni Notes & Facts.